We hope you find this report useful and informative. If you have any questions regarding its content or how these considerations may affect your business, please contact your Foley attorney or any of the contributors listed to the right. Electrical system components and networks that provide advanced control systems, collision avoidance, adaptive cruse control, lane-keeping assistance, vehicle-to-vehicle communication, and “hands off’ steering are increasingly being integrated in more new vehicles. The more complicated these components, systems, and networks are within the vehicle, the possibility of defects—and their associated warranty and recall costs—increase. If NHTSA commences a defect investigation, it is likely the OEM will be asked to submit confidential information relating to design and engineering documents, as well as test data. The supplier should consider the confidentiality of such documents and request that the OEM seek confidential treatment of the information in accordance with NHTSA’s regulations. In many cases, this will require an affidavit in support by the supplier setting forth the basis for the confidentiality of the information under relevant Freedom of Information Act (FOIA) exemptions. The supplier should develop its own position concerning whether the component or vehicle contains a safety-related defect within the meaning of the Highway Safety Act and NHTSA’s regulations, taking into consideration past NHTSA recalls and investigations involving similar components and circumstances. The supplier also should monitor new recalls and investigations, including OEM submissions and regulatory developments that may affect the supplier or its products, such as proposals for new safety standards or amendments to existing standards. Automotive suppliers also can take other simple steps prior to contracting to reduce the risk of litigation. For example, companies should confirm the specific corporate entity that will be the counterparty in the contract. The counterparty’s litigation history, credit history, and reputation in the industry should be reviewed. Companies should also confirm that the written contract accurately defines all relevant prior agreements, negotiated rights, and obligations. If the contract involves parties from different jurisdictions, a forum selection clause or arbitration clause should be considered. Additionally, for long-term agreements, the supplier should confirm that the risks of early termination have been addressed. Trade issues and tariffs likely will be an important issue for automotive suppliers and manufacturers to manage in 2019 and beyond. On March 1, 2018, a 25 percent tariff was imposed on imported steel and a 10 percent tariff on imported aluminum under Section 232 of the Trade Expansion Act of 1962 (19 U.S.C. § 1862). Because automotive suppliers typically purchase raw materials and supply components and assemblies to OEMs under long-term agreements with fixed prices, suppliers without appropriate clauses addressing such cost changes for raw materials, components, or assemblies may have limited ability to pass on increased production costs related to the tariffs. These suppliers will need to ensure that they are examining their contractual relationships to determine their ability to pass on increased costs related to raw materials and/or tariffs. Force majeure clauses and commercial impracticability under the Uniform Commercial Code (UCC 2-615) should be reviewed but it may be a difficult avenue for relief. Suppliers must also review duration, termination, and quantity terms to determine leverage points for discussions on revised terms. Additionally, suppliers should ensure that they are using risk mitigation strategies such as excluding or adjusting tariffs and duties in the product price, as well as indexing, considering available raw materials, or hedging programs. Foley & Lardner LLP routinely advises automotive and manufacturing clients on strategies to mitigate risk arising from fluctuations in raw material prices and the aluminum and steel tariffs. Forecasts for the direction of antitrust enforcement priorities under the Trump administration have been clouded by, among other things, President Trump’s frequently expressed populist themes, market interventions (including the imposition of trade tariffs and criticism of pharmaceutical pricing), and a comment in October 2016 that a major telecom deal (Time Warner/AT&T) would not be allowed in his administration. Despite these signals, the direction of antitrust enforcement appears to be stabilizing. Makan Delrahim, President Trump’s selection for the Assistant Attorney General for Antitrust post at DOJ, was confirmed by the Senate in September 2017, and DOJ promptly sued to block Time Warner/AT&T in November 2017. This (surprising) vertical merger challenge by DOJ was assigned to Judge Richard Leon (D.D.C), and following a lengthy trial, Judge Leon denied DOJ’s request for a merger injunction. DOJ has appealed that decision to the D.C. Circuit Court (although the Time Warner/AT&T transaction did close, subject to a hold-separate agreement). Despite this rough start for the new administration’s merger enforcement efforts, the U.S. antitrust agencies (FTC and DOJ, Antitrust Division) otherwise appear to be pursuing a predictable enforcement agenda. Two other major vertical mergers – Cigna/Express Scripts and Aetna/CVS – were recently blessed by DOJ (subject to a divestiture of Aetna’s standalone Medicare Part D business, a horizontal overlap, in the Aetna/CVS transaction). And FTC, now chaired by President Trump’s nominee Joe Simons, has avoided major enforcement surprises (so far). Whether possible vertical mergers in the automotive industry face any surprising agency opposition remains to be seen. The proposed combination of T-Mobile/Sprint is currently under review by both DOJ and FCC. This transaction would combine two of the four major U.S. wireless providers, in a proposed combination previously rejected under the Obama administration. The parties have asserted a host of potential synergies and efficiencies, including the ability of the combined entity to more quickly and widely roll out 5G wireless service in competition with Verizon and AT&T. As an additional competitive benefit, the parties assert that 5G service will introduce a competitive, wireless alternative for residential broadband service, currently provided by cable and telco suppliers through wireline and fiber optic connections. How DOJ and FCC treat this “out-of-market” benefit in broadband, as a possible competitive “offset” to a reduction in competition in traditional wireless telephony, will be interesting to watch. The antitrust agencies evaluate proposed mergers and acquisitions within “relevant” product and geographic markets. To help define relevant markets, the agencies apply a “Hypothetical Monopolist Test,” which asks whether a “small but significant” price increase on a product would draw competition from other products. Once the agencies define these relevant markets, the agencies evaluate market concentration (based on the number and market significance of competitors) and the anticipated competitive effects of the combination. Foreign manufacturers that supply a particular automotive product may, however, as a result of trade barriers such as tariffs, not be counted (or weighed as heavily) in this competitive effects evaluation. For example, the Trump administration’s most recently announced tariffs on products from China are expected to cover a wide range of auto parts. In a merger review involving manufacturers of a particular auto part, these tariffs could (negatively) affect the competitive significance the agencies ascribe to Chinese competitors, thus increasing agency scrutiny of the merger. DOJ’s long-running investigation of auto parts suppliers, the largest criminal investigation ever pursued by DOJ’s Antitrust Division, resulted in charges against some 48 companies and yielded DOJ almost $3 billion in criminal fines. DOJ’s auto parts investigation could influence agency reviews of automotive industry mergers going forward, as the agencies regularly consider any “history of collusion” in merger evaluations. Having an effective antitrust compliance program in place is not only a valuable business and legal practice, but also a possible means to respond to agency concerns over a “history of collusion” among auto parts suppliers. And while DOJ, in making sentencing recommendations, has historically not given credit to firms with antitrust compliance programs, that may be changing. DOJ is currently considering changes not only to the credit it gives firms with compliance programs, but also whether such programs should influence the decision to file criminal charges in the first place. If DOJ makes these changes, the business and legal benefits of implementing an effective antitrust compliance program may increase exponentially. With the midterm elections in the rearview mirror and an incoming Democratic majority in the House of Representatives, automotive industry employers can expect continued congressional gridlock on labor and employment issues. However, the Trump administration is poised to take significant regulatory action, and employers should anticipate focused immigration enforcement to continue. Meanwhile, there will likely be significant action at the state and local level, where Democrats will enjoy a newfound degree of control. These topics and more are covered below. A controversial Obama-era National Labor Relations Board (NLRB) decision that expanded the definition of “joint employment” will likely be put to rest in 2019. (Under the “joint employment” test, an employer can be held responsible for labor law violations committed by a temporary staffing agency or secondary employer, for example, depending on various factors, including the control that the employer has over workers.) The NLRB issued a proposed rule to revert the definition of “joint employer” to its pre-2015 scope, which was much more deferential to employers. This change is welcome news for employers as it will reduce the risk of liability for labor law violations committed by other “joint” employers, such as contractors and franchisees. Additionally, the Department of Labor (DOL) has announced plans to tackle overtime rules for salaried employees— including the minimum “salary threshold” required to qualify as exempt from overtime—by March 2019. Under the Obama administration, the DOL previously adopted regulations to increase the pay threshold for exempt salaried employees from $23,660 per year to $47,476 per year. That threshold would also have updated every three years to keep pace with inflation. The regulation was permanently blocked in federal court and was subsequently rescinded by the Trump administration, leaving the old rules and threshold in place. The new rule is expected to increase the salary threshold to around $33,000 per year. The DOL has also hinted that it intends to address employee and independent contractor classifications in 2019. An Obama-era administrator’s interpretation stated that most workers under most circumstances should be classified as employees rather than independent contractors. The Trump administration withdrew that guidance in 2017, and the DOL appears set to issue a new rule—likely one more lenient toward employers who use independent contractors—in mid-2019. The Trump administration has also revived the DOL’s dormant practice of issuing opinion letters. Opinion letters from the DOL respond to employer questions on a broad range of topics. Recent letters have discussed the compensability of travel time, the “reasonable relationship” between an employee’s salary and actual earnings, and the payment of bonuses. The DOL is likely to continue issuing guidance in the form of these opinion letters, and they can be a valuable compliance resource for automotive industry employers. In 2018, the Department of Homeland Security continued its efforts (1) to develop a “culture of compliance” with federal immigration law and (2) to promote hiring from the authorized workforce already within the United States pursuant to the Buy American, Hire American presidential executive order. DHS has done so primarily by increasing the scrutiny applied to immigration cases seeking permission to hire foreign nationals and by expanding worksite enforcement. This trend is likely to continue in 2019. Higher Standards Applied in Employment-Based Immigration Cases – No Deference to Prior Decisions on Extension Requests and Increased Scrutiny: DHS, through United States Citizenship and Immigration Services (USCIS), is strictly applying the legal standards to various employment-based temporary classifications, such as H-1B specialty occupation and L-1 intracompany transfer. USCIS no longer gives deference to prior favorable decisions when the employer seeks an extension of the H-1B or L-1 employment authorization. Each request is considered anew. Further, under a new policy that began in September 2018, USCIS officers have more discretion on whether to move directly to a denial or to allow the employer another opportunity to submit evidence. It is likely that this policy will result in a higher rate of denials. Increased FDNS Visits to Employers: USCIS also is increasing its site visits by Fraud Detection and National Security (FDNS) officers. The FDNS program has existed for several years, but it now is more robust. FDNS officers visit selected employers to confirm that such employers were truthful in their representations about the business, job, and foreign national. In most circumstances, these visits occur during the months after a favorable decision. The visits are most likely to occur in H-1B, H-2B, and L-1A cases. Increased I-9 Inspections and Worksite Visits by ICE: In its year-end report, U.S. Immigration and Customs Enforcement (ICE) announced that it had quadrupled I-9 inspections in fiscal year 2018. ICE initiated 5,981 Form I-9 audits and opened 6,848 worksite investigations. ICE also assessed $10.2 million in civil penalties for I-9 violations and obtained orders for over $10 million more through judicial fines, forfeitures, and other sanctions. Employers should expect that ICE will continue to focus aggressively on I-9 compliance and inspections in 2019. I-9 Forms for Current Employees: Confirm that the employer holds a valid Form I-9 for each current employee who was hired on or after November 7, 1986. There are strict timeframes for completing an I-9 Form, and doing so late is a violation. Nevertheless, a late I-9 is better for compliance than no I-9. Therefore, identify missing I-9 Forms for current employees hired on or after November 7, 1986, and promptly seek to complete an I-9 Form with such employees. I-9 Forms for Terminated Employees: Retain I-9 Forms for former employees for the longer of one full year after the employment ends or three full years from the date of hire. In an audit, the government will frequently ask for I-9 Forms for former employees covered by this retention period. I-9 Training: Ensure that only trained HR professionals or other trained staff handle the employer’s I-9 compliance. It is very important that the employer’s representative understands the I-9 rules in order to achieve compliance without violating the I-9 anti-discrimination prohibitions. Training should begin with reading the 15 pages of instructions that accompany Form I-9. Internal I-9 Audits: Once the employer’s staff is trained, conduct periodic internal I-9 audits to review and correct, if necessary, the I-9 Forms. This is an important step to lowering the risk of liability in a government audit. Initial Response to Government I-9 Inspection: ICE usually will issue a Notice of Inspection (NOI) to commence a formal I-9 audit. ICE often mails the NOI, but sometimes will serve the NOI in person at the employer’s premises. Employers have three business days to respond to the NOI. ICE may ask the employer if it wishes to waive the three-day period. It is almost never a good idea to do so. Instead, employers should use the time to prepare and consider contacting their attorneys promptly to discuss the response and strategy. If ICE has a warrant, it may take the I-9 Forms immediately, but most inspections begin with the NOI. Fines: I-9 violations can lead to civil fines and other sanctions. ICE will consider mitigating and aggravating factors to determine where within the civil fine range to impose such penalties against the employer. Employers may appeal the fines while attempting to negotiate a settlement with ICE. For the most egregious or for pattern and practice violations, criminal penalties may be imposed. Possible Changes to H-1B Cap Allocation and Administration: In early December 2018, USCIS proposed changes in how it will apply the annual allocation of H-1B slots against new cases. The annual allocation is commonly called the “H-1B cap.” More specifically, the H-1B specialty occupation is a classification under which American employers may seek temporary authorization to employ certain qualifying foreign nationals. For cases in which the foreign national has not previously been in H-1B status, the employer must prepare a well-documented case to petition USCIS for one of the H-1B cap slots. USCIS often receives many more cases than are allowed under the cap. Therefore, USCIS runs a random, computerized process to select the cases that the agency will consider. It rejects the rest. Under USCIS’s new proposal, employers will complete a short registration and submit it electronically. USCIS will run the random selection process against those registrations and notify the employers whose registrations are selected. USCIS then will grant such employers at least 60 days to prepare and submit their full cases on the merits. This change should put in place an orderly system with a reasonable schedule for cases that are selected to proceed. It will avoid the significant expenditure of the employer’s resources on cases that are not selected. It also will save USCIS’s time and resources by avoiding the current chaotic process in which USCIS often receives more than 200,000 H-1B cap subject cases over a few days and then spends months rejecting and returning most of those cases. In addition, USCIS proposes a change to how it will administer the H-1B cap. There are a total of 85,000 H-1B cap slots: 65,000 slots under the regular H-1B pool (with 6,800 of those slots being allocated under the Free Trade Agreements with Chile and Singapore) and 20,000 slots under an advanced degree H-1B cap. For the advanced degree cap, only cases involving advanced degrees from American schools may be considered. In the past, USCIS first allocated the advanced degree cap and then allocated the regular cap. Cases involving advanced degrees were allowed to participate in both pools for possible selection. Under the new proposal, USCIS first will allocate the 65,000 regular cap slots and then allocate the 20,000 advanced degree cap slots. In this way, USCIS projects that 16 percent more of the cases selected under the cap will involve advanced degrees from American schools. USCIS is accepting comments on this proposal until January 2, 2019. It is unclear whether USCIS will be able to review the comments and finalize its proposal before the April 2019 H-1B cap submission window. If not, look for this new procedure in 2020. NAFTA’s Replacement – USMCA: The North American Free Trade Agreement (NAFTA) has an employment provision under which American employers may seek authorization to employ qualified Canadian or Mexican citizens in professional occupations specifically named in the treaty. The Trump administration has stated numerous times that it will withdraw from NAFTA because of concerns over the trade provisions. Some American employers have been concerned that without NAFTA, they would lose the ability to employ their current Canadian or Mexican professionals. On November 30, 2018, President Trump, the president of Mexico, and the prime minister of Canada signed a new treaty called the “USMCA.” The USMCA retains the employment authorization provision for certain professional occupations that is found in NAFTA. The new treaty is not yet in effect. The Senate first must ratify the USMCA and then there will be a transition period. As of December 2018, NAFTA is still in place and should remain so until at least six months after President Trump formally withdraws the United States from that treaty. As the #MeToo movement enters its second year, enforcement agencies and policymakers are responding in earnest. In 2018, the Equal Employment Opportunity Commission (EEOC) filed 50 percent more sexual harassment lawsuits than in the previous year and recovered nearly $70 million for victims—an increase of $22.5 million over 2017. In May 2018, the Supreme Court handed employers a major victory in Epic Systems v. Lewis. The case involved a dispute over whether an employee could bring a claim in federal court even though his employment contract mandated that he resolve all work-related claims through arbitration. 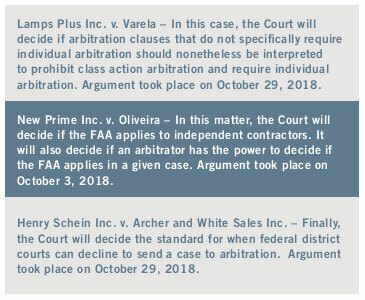 Writing for the majority, Justice Gorsuch concluded that the National Labor Relations Act (NLRA) did not override the Federal Arbitration Act (FAA) and held that arbitration clauses in employment contracts are enforceable. 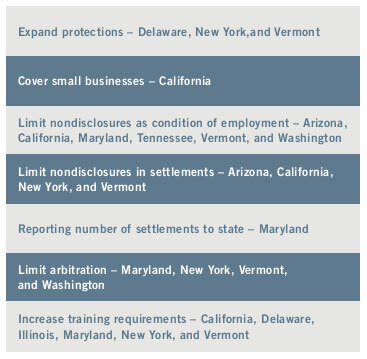 Since the decision was issued, mandatory arbitration clauses have become increasingly common in employment agreements. Decisions in all three cases are expected by mid-2019. Automotive industry employers can also expect to see a broad array of developments at the state and local level in 2019, especially as Democrats return to power in many state and local jurisdictions. Below are some of the measures that were trends in 2018 and which are likely to continue during 2019 and beyond. Paid Sick Leave: Automotive industry employers can expect to see a number of state legislatures and local governments push for more expansive sick leave in the next year. Michigan passed a paid sick leave law in September 2018, although the legislature scaled back this law in early December 2018 to exempt employers with fewer than 50 employees and to allow employers to cap sick leave offered to employees at 36 hours per year. Some counties and municipalities around the country have also debated creating or adjusting sick leave policies in recent years, so look for those debates to continue in 2019. Family and Medical Leave: Family and medical leave laws generally provide employees with a mandatory amount of paid or unpaid leave for qualifying events. These events include the birth of a child, extended health problems, and commitments related to military service. Massachusetts enacted a law mandating paid family and medical leave in 2018 that is set to go into effect over the next three years. Washington also has a new paid family leave insurance law that it will begin implementing on January 1, 2019, with benefits scheduled to be available beginning in 2020. Marijuana Legalization: 2018 was a big year for legal marijuana advocates. Voters in Michigan approved a ballot measure legalizing recreational marijuana use statewide, while voters in both Missouri and Utah approved the use of medical marijuana. In other states, including Wisconsin and Ohio, advisory referendums on the use of marijuana were approved by voters. Only a handful of states have laws that prevent employers from terminating employees who use medical marijuana, but that’s likely to change. As marijuana use becomes legal in more jurisdictions, employers may be required to reassess drug-free and zero-tolerance policies. Predictive Scheduling: This lesser-known topic is poised to take off in 2019. Predictive scheduling laws usually require an employer to notify employees of their work schedule, including overtime, a certain amount of time in advance. Such laws also typically allow employees to decline to work time that is added to their schedule late and provide protections for workers if their schedules are changed. Oregon is the only state that has so far adopted a predictive scheduling law, but major cities like New York, San Francisco, Washington, D.C., and Seattle have adopted local ordinances. Look for predictive scheduling to emerge as a hot issue in 2019. Two years into the new administration, regulators have imposed three of the ten largest Foreign Corrupt Practices Act (FCPA) penalties and the largest export controls penalty of all time, all while significantly tightening many economic sanctions regulations. All of this lies against the backdrop of ongoing strong antitrust enforcement. With the DOJ, FBI, and the SEC continuing to use dedicated resources to identify violations and to prosecute U.S. laws governing U.S. exports and international conduct, international regulatory risk management is a paramount concern for any automotive company that sells to, exports to, or operates in foreign destinations. Automotive companies that sell to, export to, or operate abroad are at heightened risk from the aggressive enforcement of these laws. Many automotive companies maintain operations in parts of the world where the respect for the rule of law is diminished (China, Mexico, and so forth). Certain non-U.S. companies maintain operations (in accordance with the laws of other countries) in Iran, creating risks due to the extra-territorial application of U.S. law. These issues are in addition to the issues that arise from any operations abroad, such as language difficulties, difficulties of coordinating compliance across thousands of miles, and a lack of understanding of the reach of U.S. law. To help deal with the current aggressive enforcement environment, this article lays out eight steps that most multinational automotive companies should take to allow them to cope with the current aggressive enforcement of U.S. international regulations. Although most companies start with drafting compliance policies, there are a number of key steps that should occur first. Among the most important is to secure the buy-in of senior management for a comprehensive compliance push. Without the support of senior management, compliance efforts often languish. Even if a comprehensive program is put into place, it will not be effective if company personnel do not believe that compliance is taken seriously at all levels of the company. Senior management must understand the importance of a consistent and reinforced compliance message and must set a strong example. The need for senior buy-in extends to the board of directors. In automotive companies that set the proper compliance tone, board-level involvement is regular and institutionalized, generally at either the compliance or audit committee levels. The key areas for board-level involvement include thorough oversight of compliance initiatives, quarterly reports of compliance activities, and special communications for potentially serious matters. The involvement of the board can be especially important when there are serious compliance missteps that may require an internal investigation. Compliance is an exercise in identifying and managing risk, allowing the organization to allocate its scarce compliance resources to give the biggest compliance payoff. Thus, a key initial step is to identify the key sources of regulatory risk through the conduct of a risk assessment. Any multinational automotive company that has not done a risk assessment in the last two or three years likely is overdue for a new assessment of the exposure of the organization to various forms of regulatory risk, as changes in the governing laws, the footprint of the firm’s operations, the ways in which it conducts business, expansion into new markets, and other factors can radically alter the risk profile of the organization. The risk assessment should consider both the likelihood and severity of possible violations and the current enforcement priorities of the relevant authority. For automotive companies that operate abroad, the key risks include not only the regulatory (economic sanctions and dealings with non-U.S. companies that operate in Iran, dealings with foreign officials that bring FCPA risk, and dealings with state-owned automotive companies), but also issues related to the business profile of the company and how it operates abroad. Once the risk assessment is complete, the results should be carefully evaluated to determine the greatest compliance concerns, with the results being distilled into a company-wide risk profile to guide the allocation of compliance resources. Sometimes referred to as a compliance gap analysis, the third step is to take a candid look at existing compliance measures (codes of conduct, compliance programs, internal controls and standard operating procedures, and training) to determine if compliance measures address the regulatory risks identified through the conduct of the risk assessment. Completing the gap analysis means having a good working knowledge of the company’s regulatory risk profile (as per step 2), how it has addressed those regulatory issues in the past, and what regulatory areas have unaddressed regulatory risk. An important part of the gap analysis is to consider not only the written forms of the compliance program, but also how effective the measures are in the field. It is common for even well-designed programs to run into difficulties when placed into operation, especially for international operations, where language, cultural, and distance issues can lead to a misunderstanding of the importance or operation of compliance measures. A candid assessment of the operation of the current controls should include a review of how the program actually operates. A key part of the gap analysis is determining whether there is a gap between the identified risks and the available compliance resources. To avoid promise/resource mismatches, multinational automotive companies should make an honest comparison of their identified risks to determine whether compliance is being starved of sufficient resources. Compliance should be viewed as an investment in protecting the firm from costly fines and reputational hits from violations of the law. For organizations that operate in high-risk environments or otherwise have a heightened risk profile, effective compliance may take the commitment of significant resources to secure this kind of protection. Many organizations try to centralize compliance within U.S. headquarters. But effective implementation and oversight of compliance measures often requires on-the-ground attention. For larger organizations – or companies operating in high-risk regions – compliance liaisons are generally necessary to ensure that compliance actually functions as envisioned. This can be especially true for foreign subsidiaries, joint ventures, agents, distributors, and consultants. A written compliance policy should usually include a written compliance program and, for high-risk legal regimes, supplemental materials for individuals who need specialized training or guidance to oversee or comply with the relevant legal regime. The focus should be on readability and avoiding long or legalistic recitations of the legal requirements. The goal is not to create a workforce full of law professors; rather, it is to communicate when personnel need to pick up the phone and make a compliance call. Although many automotive companies focus their attention on the compliance policies, internal controls can be as or even more important, as they implement the compliance standards and make them work. For example, export control policies often should be supplemented with stop, hold, and release measures and (for controlled technical data and goods) physical security, visitor access, and technology control plans. Economic sanctions require that there be written controls regarding screening for embargoed persons, automatic approval procedures for sales to comprehensively embargoed countries, and written procedures for identifying and clearing red flags. For anti-bribery measures, gifts, meals, entertainment, and travel measures, controls on the use of gift cards, and accuracy in books and records requirements will augment the ability to implement compliance initiatives. Companies should tailor their internal controls to the company’s operations, areas of operation, and business profile, addressing the types of risks covered in the company’s risk assessment. Training – implemented in conjunction with a well-written compliance program and appropriate internal controls – forms the third leg of the compliance stool. Training should be tailored to the needs of the organization and job descriptions of persons at a high risk of encountering certain legal regimes. Training should focus on the purpose of the law, how it protects the organization to comply with the firm’s compliance measures, and how to identify red flags and other problematic situations that require reaching out to compliance personnel. For personnel at high risk, training should occur not only for all new employees, but also annually thereafter. For multinational automotive companies, training will often need to address local practices and different cultural norms that may prove contrary to the compliance needs of the organization. Equally important is finding the best way to stress the importance of compliance with U.S. law for personnel who may not appreciate the risk exposure to the company. If English is not widely spoken, compliance materials and training should be done in the local language. Companies should avoid the fallacy of thinking that a compliance program, once implemented, can run on autopilot. Compliance processes are never completed, and the goal is not to perfect the system of risk management. Effective compliance requires that the company consistently monitor compliance measures and test the operation of its internal controls. Companies should use risk-based auditing principles to determine the countries, divisions, subsidiaries, and third parties that require monitoring through compliance audits and check-ups, and consider extending such check¬ups and audits to third parties as well. In the current regulatory environment, regulatory risk management continues to be essential for all automotive companies – especially those that operate abroad. Through a self-reinforcing compliance system, automotive companies can maintain compliance policies, internal controls, and training that provides reasonable controls to protect the organization from regulatory risk in its many forms. Although compliance implementation will vary by organization, working through the eight steps outlined above will be a good starting point for companies looking to mitigate the risk flowing from the aggressive enforcement of U.S. laws governing exports and international conduct. 2018 delivered a boom for automobile technology and connectivity, accelerating recent trends for connected cars. Consumers now expect the devices they purchase to be more integrated and provide more functionality than ever before, and more and more manufacturers are incorporating these technologies into new vehicles. In response, the modern car often includes the services of a digital chauffeur, navigator, scheduler, receptionist, and personal assistant. Artificial intelligence is being felt in all aspects of today’s vehicles. Cars often contain software to provide on-board diagnostics and alert operators to potential maintenance and safety issues. Further, automobiles are expected to communicate with the driver’s other personal devices and the applications and software services contained thereon, including email, calendars, music apps, and other entertainment. But as cars increasingly become more personal and integral to the driver, the risks of cyberattacks and cyber-thefts also increase. To maximize connectivity and functionality, a car’s systems and software must connect and communicate with other systems. As manufacturers and regulators now agree, this integration creates doorways into the car’s own network that can be vulnerable to cyberattacks. As evidenced by the headlines of high-profile attacks plaguing other industries, a security breach can damage a company’s reputation and value. Cyberattacks affect a company’s personnel and talent as they can result in firings and resignations. Moreover, a company that is not planning for cyberattacks can be exposed to regulatory investigations, civil claims from business partners, shareholders, and employees, and even class action lawsuits. The complexity of a car’s network and functionality make navigating cybersecurity practices difficult. However, we set forth below some guideposts that are emerging in this new area for you as your company thinks about how to best protect both its consumers and itself. In this article, we set forth what we believe to be some of the most significant developments in risks for automobile cybersecurity in 2019, and what you should be thinking about to address them as your company heads into the new year. We now know that cybersecurity is an arms race (good guys versus bad guys) with respect to corporate networks, and connected cars are no different than other industries and governments that have been the subject of cyberattacks. As hard as companies are working to implement new security policies and technology to keep up with new and emerging threats, hackers are working diligently to undermine them. However, knowledge of the current issues, and what the best practices are to address them, is the first step to protection. As much as consumers are demanding more software functionality in their cars, effective data security is no longer the sole responsibility of the information technology department – customer service, in-house counsel, marketing, public relations, and most importantly, senior and operational management of the organization must also play a critical role. And it’s not just consumers – regulators are also demanding that senior management become involved in and accountable for data security. Creating the right culture can be jeopardized if there is not a top-down message and implementation of data security. Companies should be sure to properly educate and train all relevant employees with respect to their role in the cybersecurity program. Engineering, information technology, research and development, and production teams should all be given appropriate resources and knowledge to effectively manage their involvement in the data security efforts of the organization. Effective buy-in, training, and messaging (both internally and externally) will serve the dual purpose of enhancing the data security of vehicles and component parts while also bolstering the company’s reputation and goodwill in the marketplace. In the last two years, government agencies, industry groups, and consumer organizations have increasingly pushed for security to begin on the drawing board. Accordingly, security by design is now a priority of the Auto-ISAC and federal regulators, namely the National Highway Traffic Safety Administration and the Federal Trade Commission. No longer can cybersecurity be an afterthought as in years past. Security should be designed with the nature and sensitivity of personal information and other data taken into consideration. Security design reviews and product testing should be conducted throughout the development process. Secure computing, software development and networking practices should address the security of connections into, from, and inside the vehicle. Companies need to be proactive against safety threats by continuously monitoring and detecting new and constantly emerging vulnerabilities and threats. Companies should start by utilizing a rigorous risk assessment methodology for identifying potential threats, vulnerabilities and risks to data and data security. This process catalogs and prioritizes the various sources of cybersecurity risk; implements a decision-making process to manage the identified risks; involves other partners in the supply chain; implements risk mitigating controls; and monitors the evolution of risks and risk mitigation in a continuous improvement cycle. Knowledge of the potential harm, in turn, enhances and feeds information to the incident response teams and allows for the earlier addressing of concerns. Early detection is the best way to reduce harm to consumers and to lower the cost of any attack. In 2018, several high-profile security breaches affected the auto industry, including thieves hacking wireless key fobs to steal cars in the U.K. Hackers were also able to access vehicle owners Amazon accounts through the app in the car’s connected dashboard. Although cyberattacks are progressively becoming a “when” rather than an “if,” an effective incident response program will enable organizations to quickly respond to incidents such as these, thereby mitigating (or hopefully avoiding!) harm to the organization, business partners, and consumers. Manufacturers should include methods to deliver periodic security patches and updates to consumers. An incident response policy should identify in advance members of the response team, including IT security and forensics, engineering, legal, management, stakeholders, and public relations/ communications. The policy provides guidance and details relating to the roles and obligations of the team members. Over the last year, engineers and executives are having more conversations with hacktivists to collaborate and develop best practices for minimizing threats. Organizations should work closely with suppliers, industry associations, governmental agencies, academic institutions and researchers, and other business partners as part of a well-rounded cybersecurity program. Whether it is the finished vehicle or a component part, most companies relevant to the data security ecosystem will rely on suppliers that play a role in data security. Hardware, software, development tools, assembly, integration and testing may all be provided by one or more suppliers. Companies impacted by this scenario should conduct appropriate due diligence and risk assessments with respect to their suppliers, both at the commencement of, as well as periodically throughout, the relationship. Contractual provisions should also be utilized to address data security requirements for relevant suppliers, particularly suppliers of software and applications you incorporate into your vehicles. Manufacturers and regulators appear to now agree that planning for cyberattacks requires a comprehensive and holistic approach, as no one software application or technical component is a silo as was more common in years past. Virtually all facets of the organization, and sometimes third parties as well, will need to be involved to properly plan, implement protections, and prepare for cyberattacks. The regulations and laws governing this area are constantly in flux, as new legal developments seem to change the legal landscape daily. However, taking action now, including by planning for the issues raised above, will keep your company one step ahead of the attackers as we all head into 2019. As with any 25-year-old contract, however, NAFTA needed to be revised. Negotiations required delicate balancing between technical and political issues, with motor vehicles and auto parts requiring the lion´s share of the modifications. 1. The (possible) execution of the USMCA, and what it means, particularly, for motor vehicles and auto parts manufacturing and sales in North America. The USMCA, signed by presidents Trump and Peña-Nieto, and Prime Minister Justin Trudeau on November 30, 2018, is making its way through the legislative process in each country. The 2018 U.S. election brought a Democratic majority into the House of Representatives, which is now asking for modifications to what was negotiated, particularly in its labor and environmental provisions. As for motor vehicles and auto parts manufacturing and sales in North America, the USMCA - if approved - will mark a transformation from a simple, straightforward compliance-or-not of the relevant Rule of Origin (ROO) into a complex tracing system of production for motor vehicles in which not only a more stringent Rule of Origin will have to be fulfilled (from 62.5 percent to 75 percent in a five-year transition period), but 70 percent of steel and aluminum should be sourced within the NAFTA region, and 40 percent of its manufacturing would have to be made with labor of US $16-an-hour or above; we should note, though, that the aforementioned requisites are already fulfilled by 68 percent of current motor vehicle exports, as per former Mexican Secretary of Economy Ildefonso Guajardo. (Of course, this summary does not cover the many details that are relevant, nor does it touch upon the new classification of auto parts into several, highly-detailed lists that range from “super core” to “complimentary” parts. For a detailed analysis, visit https://www.foley.com/ Understanding-and-Coping-with-the-US-Mexico-Canada-Agreement-USMCA-Updates-NAFTA-Rules-of-Origin-for-Motor-Vehicles-and-Auto-Parts-11-08-2018). 2. The newly elected (2018-2024) Lopez-Obrador administration. 4. New Mexican Anti-corruption Law. The National Highway Traffic Safety Administration (NHTSA), the primary regulator of motor vehicles and motor vehicle equipment, continues to be active in investigating potential safety-related defects and noncompliance with Federal Motor Vehicle Safety Standards (FMVSS). As the deployment of advanced vehicle technologies continues to accelerate, NHTSA has been increasing its enforcement capacity and looking for ways to encourage further innovation in automated technologies. NHTSA’s approach to autonomous vehicles has been and will likely continue to be a wait-and-see approach, while leveraging its research capacities and conducting industry outreach to further understand the building blocks of advanced driver assistance systems (ADAS) to enable the agency to develop future regulations that do not stifle innovation. NHTSA has been working to double the headcount in its Office of Defects Investigation (ODI). Over the past year, the agency has added a number of new investigators and reorganized its enforcement office. In concert with the staff additions and structural changes, NHTSA has continued developing a more data-driven approach to determining whether to open an investigation. Looking to leverage what NHTSA learns during periodic meetings with manufacturers under Consent Orders, the agency has sought similar, voluntary meetings with major OEMs and large Tier One suppliers. Manufacturers are not required to agree to these meetings and NHTSA’s expectations for these meetings are not clear, but regular contact with ODI and the Office of Vehicle Safety Compliance (OVSC) can be beneficial in understanding NHTSA’s focus and can aid in building a constructive relationship with the agency. When engaging in these informal meetings, manufacturers should look to understand what the agency’s expectations are, particularly in terms of what information NHTSA expects to be shared. Suppliers should also be sensitive to their customers’ views with respect to these meetings and how their information might be shared with NHTSA. NHTSA also continues to seek ways to leverage the mountains of data that it regularly collects – vehicle owner questionnaires (VOQs or customer complaints sent directly to NHTSA), early warning reports, accident reports, and more – using sophisticated data-mining techniques. For more than a year, NHTSA has been working with manufacturers to develop risk matrices to guide its decision-making around the opening of formal investigations. The agency’s intention has been to develop a matrix for specific risk categories, such as engine compartment fires, and build a table that weighs the likely safety consequences of a particular condition (severity) against the number of occurrences (frequency). Comparing the severity with the rate, the matrix would use data currently collected by or available to NHTSA to determine when a formal investigation should be opened for a particular issue. NHTSA has worked with a number of manufacturers to develop the matrices and has stated its intention to make them public to demonstrate a more objective and transparent process. NHTSA has yet to officially release specific matrices and it appears they are still under development. NHTSA’s investigations staff was active throughout 2018, opening more than 30 formal investigations, including six engineering analyses and 14 preliminary evaluations. As new investigators become fully integrated into NHTSA and additional support is added, manufacturers should anticipate that NHTSA will continue to actively open formal investigations, as well as make more informal contact with manufacturers to discuss potential safety issues prior to opening a formal investigation. Manufacturers should actively monitor NHTSA’s VOQ data for complaints related to their products to prepare themselves for potential questions from NHTSA. Manufacturers should also have processes in place to enable them to promptly and effectively respond to NHTSA inquiries. NHTSA also has made changes in its Recall Management Division (RMD), which oversees the administration of recalls filed by manufacturers. In 2018, the Department of Transportation’s Office of the Inspector General released a report that was critical of certain aspects of NHTSA’s oversight of passenger vehicle recalls. The report found that NHTSA’s processes lacked documentation and management controls and did not “ensure that remedies are reported completely and in a timely manner.” Relevant to manufacturers, the criticisms also included NHTSA’s failure to follow up on required documents that were not submitted during the recall, lack of processes for monitoring equipment recalls, failure to monitor the scope of recalls, and failure to verify recall completion rates. Since these criticisms, NHTSA has increased its focus on ensuring that manufacturers timely submit all the required documents and information. For example, NHTSA has begun looking more closely at defect information reports to ensure that the description of the recall scope provides a clearer explanation regarding how the scope was chosen. Conduct thorough training of key personnel across the organization – domestically and globally – on these procedures and on the importance of bringing potential safety concerns to the attention of appropriate personnel or safety committees. The U.S. Department of Transportation (USDOT) has been actively reviewing regulations throughout the country’s ground-transportation network (motor vehicles, rail, commercial vehicles, transit companies, and internal infrastructure) to promote regulatory consistency; to adopt flexible, technology-neutral policies that promote competition and innovation; to modernize regulations and remove regulatory barriers to advanced and autonomous technologies in transportation; and to provide guidance, best practices, and pilot programs to promote automation throughout the transportation network. These principles were explained in detail in the USDOT’s Automated Vehicles 3.0: Preparing for the Future of Transportation (“AV 3.0”) released in September 2018. AV 3.0 builds on and clarifies prior policy statements released in September 2016 (AV 1.0) and September 2017 (AV 2.0). Due to the rapid changes in autonomous vehicle technologies, the industry should anticipate further refinements to the policy in 2019. AV 3.0 contains principles that will guide future policies. A key principle is the focus on removing regulatory barriers that may constrain the development of automation and issuing voluntary guidelines rather than regulations that may stifle innovation. The policy also states that NHTSA’s current safety standards do not prevent the development, testing, and sale of ADAS in vehicles that comply with current FMVSS, including maintaining traditional controls for human-operated vehicles. Current regulations, however, may pose regulatory barriers for alternative designs, such as non-traditional seating arrangements or vehicles with steering wheels and pedals. In light of these statements, AV 3.0 states that USDOT, including NHTSA, will interpret and adapt regulatory definitions of “driver” and “operator” to recognize automated systems. Further, NHTSA plans to continue using the self-certification approach to safety standards (as opposed to the type-approval approach used in Europe) and actively seek to remove regulatory barriers. “Low-Speed Automated Shuttles: State of the Practice,” DOT-VNTSC-OSTR-18-03 (Sep. 2018). This growing body of research will guide NHTSA’s future evaluation of ADAS and Level 3 through Level 5 autonomous vehicles. Manufacturers working in the ADAS space should study this research, take advantage of the opportunity to publicly comment on NHTSA’s proposals, and reach out to NHTSA to ensure Agency personnel remain apprised of the latest technologies. As these technologies grow more specialized and the interaction among various vehicle components becomes more complex, manufacturers should work with the Agency to ensure that NHTSA understands their technology well enough to regulate and investigate potential failures appropriately. A few weeks after the House passed its bill, a similar bill, the American Vision for Safer Transportation through Advancement of Revolutionary Technologies (“AV START”) Act, S. 1885, moved out of the Senate Committee on Commerce, Science and Transportation by unanimous vote. The Senate bill would have excluded commercial trucks from key provisions and contained several differences with the House version. The AV START Act has languished in the Senate for over a year and, at the time of this writing, negotiations within the Senate are underway to address the concerns of certain senators, but the bill does not appear poised to pass. With a new Congress in January 2019, these bills will need to be re-introduced and will potentially be changed to reflect the make up of the new Congress and changes to vehicle technology since the bills were originally introduced. The future of NHTSA’s proposed rule on vehicle-to-vehicle communication in all light-duty vehicles remains in flux. Under the proposed rule, the Agency would issue a new FMVSS No. 150 that would require new light vehicles to be capable of sending and receiving “Basic Safety Messages” related to the vehicle’s speed, heading, brake status, and other information to and from other vehicles over dedicated short-range radio communication (DSRC) devices. In addition to vehicle positional and behavioral data, V2V and so-called vehicle-to-infrastructure (V2I) communications could potentially transmit environmental data, such as road conditions, to surrounding vehicles. There continues to be a debate on whether the use of DSRC or cellular technology will be the future of V2X communications (the combination of V2V, V2I, and any other devices that will communicate). Significant investment in V2X technologies has already been undertaken and will likely continue, regardless of whether NHTSA’s rule becomes final. Two major OEMs have announced that they have or will roll out vehicles using DSRC. The debate, however, continues and will likely become more interesting when the forthcoming 5G wireless system begins to come online. As the technology develops and proves its viability, expect NHTSA and USDOT, with its authority over transportation infrastructure, to continue to play a role in this area. Many automotive suppliers and OEMs have announced plans to bring autonomous vehicles (AVs), and related components, software and services to market. In almost all of these cases, the automotive suppliers and OEMs are collaborating with technology startup companies to develop the underlying hardware or software. As parties work together to develop technical solutions needed to bring AVs to market, the resulting intellectual property (IP) can become a key asset of the automotive supplier, the technology startup company or both. A failure of a party to properly protect and capture IP around its technical solutions can impede its business goals as well as delay the development and deployment of AVs. 1. What is an IP strategy? Every technology startup and automotive supplier must have an IP strategy that is aligned with its short and long-term business goals to enable them to successfully bring AV-related systems, components, software and services to market. The owner of the IP assets resulting from a well-executed IP strategy can leverage the assets during negotiations, increase their valuation, publicly promote their innovations in marketing materials, keep out competitors, and monetize their IP by generating a royalty-based revenue stream. The IP strategy should prescribe how and when the technology startup and automotive supplier will pursue and protect their joint or respective intellectual property in a manner that fits the business goals, and also takes into account ownership of the resulting IP. The IP strategy should support the technology startup’s growth and exit strategy, while also supporting the automotive supplier’s goals for creating barriers to entry. An ideal IP strategy is one that creates value, reduces risk, and is realistically achievable for both the technology startup and the automotive supplier, thereby facilitating the successful deployment of AVs to market. 2. How does the IP strategy protect proprietary competitive information? An IP strategy and plan leverages legal tools in a systematic and repeatable manner to identify and capture a company’s proprietary competitive information. The IP strategy and plan should account for any inherent challenges raised by the company’s culture, expedited development and deployment roadmap, and strategic goals. Challenges posed by the culture of an early-stage AV technology startup may revolve around the openness with which founders discuss their innovations with third parties, operating in collaborative shared workspace environments where individuals bounce their ideas off of third parties, or initial discussions when recruiting new talent or potential partners. Even as the company moves beyond early stage, additional challenges arise from its need to make public disclosures to persuade potential customers or regulatory entities of its AV-related innovations. Common scenarios for inadvertent public disclosure of IP include a) a technology startup demonstrating a new hardware component or software algorithm to an automotive supplier; b) the automotive supplier disclosing its AV deployment plans; c) experimenting with the AV on public streets; d) discussion when raising capital; e) discussion when recruiting talent; f) publishing a white paper or thesis or presenting same at a conference; or g) selling or offering to sell a vehicle that embeds the new sensor for data collection purposes or a back-end process unbeknownst to the owner of the vehicle. In addition to inadvertent public disclosures, companies may overlook protecting their IP around their software-related innovations, such as their Artificial Intelligence or algorithms used to enhance the AV’s safety, accuracy, reliability, robustness, efficiency, or user experience. Therefore, to provide the company with the ability to create value and reduce risk in the competitive AV field, it is paramount to establish and execute an IP strategy and plan to obtain IP protection at an early stage and before any public disclosures. This can be difficult in practice in a fast-paced environment with high levels of collaboration between technology startups and automotive suppliers. As part of an IP strategy to protect proprietary competitive information, the company should establish a plan and process for identifying the functional features of its solution that differentiate it from the competition, and the innovations that enable such features. The company needs to identify which individuals or parties contributed to the innovation, and then determine which tools in the toolbox of IP protection (trade secret, copyright, trademark, patent, or contractual) to deploy to protect the innovation. Ensuring that all documents are marked as confidential and physically locked, that all electronic systems are secured with adequate encryption and authentication, and that confidential information is always discussed in private. 3. How does the IP strategy account for ownership? The ultimate goal of an IP strategy is to obtain ownership of the IP so that it can be monetized. Therefore, it is not sufficient to merely create the IP asset without also having a plan to retain the appropriate ownership or rights over the IP asset. In the absence of any formal agreement governing ownership of IP, any IP rights generated or derived from an individual’s employment or consulting relationship may inadvertently be waived or may be owned by another company. As part of an IP strategy, companies should, therefore, ensure that they take steps to ensure that they retain ownership in the IP prior to collaboration with other parties. Likewise, automotive suppliers that may not have historically collaborated with technology startups should be aware of cultural differences related to how entrepreneurs and members of technology startups operate, such as loose or non-existent non-compete clauses, and the ease and rate at which employees can switch from one technology company to another. Failure to take steps to retain ownership of IP may prove costly to the company and may impede capital formation and product development. Recently, individuals working at a large technology company left to create their own technology startup that specialized in autonomous trucking innovations. The new technology startup was acquired by another large technology company. After the acquisition, the initial technology company that employed the individuals sued the acquiring technology company for alleged theft of IP. The acquiring technology company ultimately settled the dispute, and soon after decided to shut down its autonomous trucking plans. To mitigate these and other risks related to IP, investors of technology startups likely will perform due diligence to determine whether any IP ownership issues exist. As part of an IP strategy, the company should take all steps necessary to transfer or assign all IP rights to the company. If the technology startup has not taken steps to protect and retain ownership of its IP, the startup may be inhibited from commercializing its innovations with other companies. Establishing and executing a comprehensive IP strategy that allows a company to identify and protect its IP, while retaining ownership in the IP, can play a pivotal role in the success of both the automotive supplier and the technology startup. 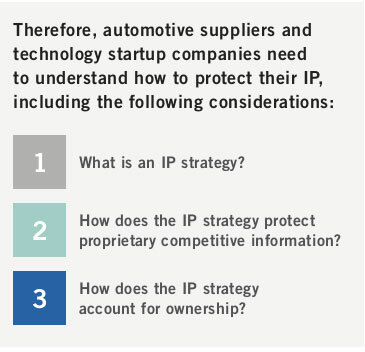 As such, automotive suppliers, OEMs, or technology startups should seek experienced counsel early on to help avoid the numerous pitfalls and challenges with IP protection and ownership. Foley & Lardner LLP is uniquely positioned to provide such counsel by leveraging its historic experience working with both large automotive suppliers and technology startups to develop and execute a customized IP strategy for an AV company. 2018 was another exciting year for M&A activity in the automotive sector. Accelerated growth in U.S. and global economies from the last quarter of 2017 through most of 2018 provided added munitions in the continuing arms-race for emerging automotive technology supremacy and the industry’s expansion into new verticals like ride-sharing and other mobility apps. We saw deal volumes in the automotive sector remain strong and deal values at or near all-time highs despite a number of emerging factors that traditionally could be seen as having material dampening effects on M&A activity in the sector, including rising interest rates and geopolitical uncertainties relating to the imposition of tariffs and opening up longstanding trade agreements. While some of these headwinds, and the recent GM announcement and anticipated Ford announcement of cutbacks, have the potential to reduce capital necessary for investments or otherwise risk encouraging some to take a “wait and see” approach, short of the bottom unexpectedly falling out from the economy, there appears to be continuing inertia in the automotive M&A deal-space in 2019 for another good year for deal activity. OEMs, suppliers, technology companies and other investors of all kinds (from traditional private equity, to venture capital funds to sovereign wealth funds) appreciate that there is no time to wait in order seize lucrative opportunities in order to position themselves for long-term success in an industry that is so quickly evolving. Though we await final numbers for Q4 of 2018, we know that M&A activity through the first three quarters was very strong. PwC reported that the aggregate value of M&A deals in the automotive sector through the end of quarter three of 2018 was $59.3 billion, on pace to be the highest in the last 10 years and which represented a 48% increase over the first three quarters of 2017. Some of the more notable larger-value deals include Tenneco’s acquisition of supplier Federal Mogul for $5.4 billion and Novelis, Inc.’s announced acquisition of Aleris Corp., a producer of aluminum rolled products for the industry for over $2.6 billion. Market watchers have also continued to see high purchase price multiples for automotive transactions, especially in the software and certain parts and components manufacturing categories. A clear example of this is Cars.com’s acquisition of Deal Inspire, an automotive advertising software and services provider, for healthy EBITDA (earnings before interest, taxes, depreciation and amortization) multiple of 41x. Overall, PwC saw average EBITDA transaction multiples through the first half of 2018 hold steady at 8.4x from 8.3x in 2017. While 2018 was a great year for M&A activity in the automotive sector some reasonably question whether this trend can continue into and through 2019 given a number concerning macroeconomic developments and market uncertainties. Several of these factors have the potential to dampen deal activity, including rising interest rates, tariffs and trade disputes and certain regulatory developments. In addition, as we enter the 9th year of automotive market expansion coming out of the Great Recession, many are forecasting a cyclical recession on the near term horizon (by 2020), which would hinder some M&A activity while providing opportunities as well. First is the continual ratcheting up of interest rates. The U.S. Federal Reserve Board of Governors raised interest rates four times in 2018 and is expected to continue to raise rates at least twice in 2019, although recent comments and market volatility may dictate a more “wait and see” approach. Rising interest rates always have the potential to slow deal activity as buyers who typically rely on debt to facilitate deal making, such as private equity investors, as more cash flow is devoted to debt amortization vs. paying equity value. A second factor which of course has the whole of the automotive industry worried are the imposition of tariffs that do and would necessarily lead to increased vehicle prices, lower sales and therefore less capital available for investment and transaction activity. According to an October 2018 report conducted by the Center for Automotive Research, a 25% tariff on U.S. imports of light vehicles and parts, which remains a possibility at the time this article is being written, would drop U.S. light vehicle sales by 12%, reduce U.S. light vehicle export by 357,000 units and lead to increased light vehicle prices for consumers of at least 10%. Since President Trump’s executive order in March 2018 to impose tariffs of 10% on imported aluminum and 25% on imported steel under Section 232 of the Trade Expansion Act of 1962, we have seen a back and forth of reprisals and threats to and from other countries, China in particular, that threaten to have a material impact on the industry. Relatedly, most Free Trade Agreements (such as NAFTA) are in some stage of renegotiation and recently the U.S., Canada and Mexico have agreed in principle to change and rebrand NAFTA, which has now been named the U.S.-Mexico-Canada Agreement (USMCA). Changes to long-standing trade agreements have the potential to disrupt the status quo and otherwise generate uncertainty in the marketplace, which can be bad for deal-making as it has the potential can drag down or delay decision-making and make business due diligence more troublesome. The impacts of any trade policy changes will continue to be watched closely as we enter 2019. Another regulatory development in the U.S. worth noting is the recent codification of foreign investment restrictions imposed by the Committee on Foreign Investment in the United States (“CFIUS”), which is an interagency committee that conducts national security reviews of foreign investments in U.S. businesses, following the August 2018 passage of the Foreign Investment Risk Review Modernization Act (“FIRRMA”). Under FIRMMA, which in part codified existing CFIUS practice, CFIUS is empowered to block or even unwind cross-border investment transactions that it views as a potential threat to U.S. national security (which concept increasingly is being merged with “U.S. economic security”). CFIUS review has been more recently focused on critical infrastructure and access to sensitive technology and has been intently focused on investments from China and certain other geographies in U.S. companies that are developing technologies related to electric and autonomous vehicles. Even if transactions may eventually pass CFIUS muster the process to obtain clearance from CFIUS is time-consuming and expensive, as application of the “Foreign Ownership, Control and Influence” rules take some time to diligence in almost all transactions. Given these increased risks it is no wonder that we have already seen a decrease in investments in U.S. companies from China, based on figures from Thomson Reuters and research group Dealroom. In addition, over 75% of bankers, lawyers and consultants interviewed on the topic by Reuters, said their Chinese clients were increasingly choosing Europe over the United States because of growing difficulties with CFIUS. This has the potential to have a direct impact on automotive deal activity as, according to Reuters, in the last five years alone Chinese companies have funded at least 80 U.S. transportation startups with a combined valuation of more than $80 billion. Finally, as mentioned, the automotive expansion cycle is entering its ninth year in North America, and production and sales numbers all indicate a market that is plateaued, post-peak and starting to decline. General Motors recent announcement of planned production cuts to align with sales and to focus on autonomous and other investments, is an early harbinger that automotive suppliers with an unhealthy product or platform mix, combined with leverage, may face challenges in adapting to market and production changes and create distressed M&A opportunities for some buyers. All of the factors noted above have the potential to have some measurable negative impact investment on deal activity in the automotive sector in 2019. Nevertheless, the overall outlook for automotive M&A remains positive on balance due to the continued fervor surrounding investment in ride sharing/mobility, autonomous/connected vehicle, online vehicle dealerships/trading platforms and other technological vehicle features and platforms. The automotive industry is transforming at an ever-accelerating pace. As Lisa Joy Rosner, CMO of Otonomo conveyed to her interview at Flex, car manufacturers are transitioning from being hardware to software manufactures and now find themselves in a position where it is necessary to “continually update their software and provide service far beyond the initial transaction.” This paradigm shift is leading manufacturers, suppliers, equity/venture funds and technology companies to continue to invest heavily in automotive technologies, bringing with it changes to business models and product offerings. And, because of the significant capital requirements and uncertainties, we will continue to see collaborations like Honda’s investment in GM/Cruise Automation and Ford’s reported current talks with Volkswagen, especially among OEMs that have “complementary” (read: non-overlapping) strengths and geographies. One of the most interesting developments of the last few years has been that strategic investors are increasingly becoming active in early stage venture investing opportunities. Seventy-five of the Fortune 100 are active in corporate venturing and over 40 have dedicated corporate venture capital teams. The automotive sector is at the center of much of this strategic investment with General Motors, Honda, Ford, BMW, Toyota, Daimler AG, Volkswagen, among others, all making sizable investments. For founders/ sellers of early-stage automotive technology companies these corporate venture capital groups can offer several advantages over “traditional” venture capital funds, including dedicated marketing and research/development groups, built-in customers and distribution channels and have a perception that they will generally play a more passive role in management than your average traditional venture capital fund. However, strategic venture capital funds are also frequently perceived by potential targets as generally slower to make decisions, less familiar with the needs of venture capital-backed companies and more focused on strategic objectives that may not always be consistent with the target’s objectives. On balance in 2019, CVCs are expected to continue to provide a helpful influx of capital in critical segments of the evolving automotive and mobility industries. While the economy overall is strong and vehicle sales are still robust, though lower than the record pace of the past few years, there are risks in the industry which may affect the supply chain and cause disruptions in the coming year. Chief among these are the ongoing concern regarding tariffs on products such as steel and aluminum, and the on-again, off-again trade disputes with China. In addition to the upheaval in global markets, the shift in the automotive industry away from passenger cars and toward trucks and sport utility vehicles has caused automakers to realign their product offerings and even end the production of a number of car models. For suppliers who have been dependent on contracts to provide parts for these vehicles, this realignment could be very problematic. In addition, higher interest rates may complicate financing for those businesses that need additional capital to address these changed circumstances. The Trump administration’s policies, which are designed, among other things, to correct perceived trade imbalances with America’s largest trading partners, are having a significant impact on the automotive industry. Commodity costs are rising dramatically due to the increased tariffs and the retaliatory tariffs other countries have imposed. Ford and General Motors executives have each reported their expectation that their steel and aluminum costs are estimated to be $1 billion higher next year than this year. Suppliers’ profitability will suffer from these increasing commodity costs. Smaller suppliers are already dealing with pressure from higher raw materials costs, which they cannot pass on to their customers under their fixed-price contracts. There is little doubt that these higher tariffs are already causing stress in the industry. But perhaps even more alarming is the constant uncertainty of what the future holds. For example, the United States and China recently agreed to a 90-day “cease fire” in the escalating trade war. This time-out may provide an opportunity to negotiate a resolution. However, it is unclear whether the negotiations will be successful. Furthermore, the Trump administration’s threat to add tariffs to certain imported vehicles (particularly German cars) is a cause for concern among automakers and suppliers. Suppliers are in a difficult position because they may be subject to new tariffs or restrictions on the sale of their products, and they have little ability to anticipate these changes before they happen and react accordingly. Therefore, as the ongoing trade disputes with China and Europe, among others, continue to develop, customers will need to be aware of potential risks to their downline suppliers and anticipate future problems before they affect the supply chain. For example, Foley attorneys have been assisting clients in seeking tariff exemptions from the Department of Commerce for products which are not produced in the United States in a sufficient and reasonably available amount, or for which there is a national security consideration that would justify exempting that product from tariffs. However, automotive manufacturers have already filed over 1,000 of these exemption requests, and the majority of those requests are still awaiting a determination from the government and another 300 requests have been denied. Therefore, while it is important to seek these exemptions for products that meet the criteria discussed above, suppliers need to develop other strategies to obtain critical products. In addition to the global trade uncertainty, there is a significant shift in customer demand for vehicles in the United States. In the past few years, the demand for passenger cars has decreased and the demand for SUVs and light truck products has increased. However, the increase in demand for SUVs and truck products is unlikely to offset the reduced car demand. Manufacturers are already responding by changing their product lines and eliminating car models altogether. Recently, GM announced that it would stop production of several car models, idling five plants in North America, including two in Michigan, and implementing layoffs of more than 10 percent of its workforce. Earlier this year, Ford announced that it would not make any passenger cars, except for the Mustang, in the future. The dramatic reduction in passenger cars, as well as softening volume overall, might push some suppliers into distress. According to Laura Marcero, the industrial practice leader at Huron Consulting Group, suppliers are likely to see softening volumes in the next 18 months due to these changes in production. These changes in demand will affect those suppliers that focus on producing products for passenger cars, and also those that may have already been experiencing some financial difficulty. This is likely to exacerbate the effect of increasing commodity costs and trade woes facing suppliers and the industry as a whole. While suppliers are dealing with tariffs and changes in entire product lines, other economic factors are at play. For example, the Federal Reserve has increased interest rates several times in 2018. As interest rates increase, borrowing becomes more expensive, both for businesses which rely on commercial credit, and for consumers, including those looking to finance new vehicle purchases. Furthermore, while credit has been relatively easy to obtain in the past few years, many businesses are carrying significant debt loads and may have trouble financing those obligations in the future, causing them to falter. The market conditions above are likely to cause some suppliers to have difficulty fulfilling their contracts, or to seek price increases from their customers, including other, higher-tier suppliers in the supply chain. In addition, the shift from passenger cars may cause individual suppliers who are dependent on those products or who are operating on thin margins to falter. A troubled supplier in the supply chain can cause significant harm to the upstream suppliers and ultimate customers. Customers should routinely evaluate the companies in their supply chain for warning signs of distress. Here, we identify some of the top warning signs for troubled suppliers, and discuss potential actions to reduce the disruption that may be caused by a troubled supplier. Where these signs exist, the exercise of common law and statutory remedies may allow a customer of a troubled supplier to achieve proactive changes to standard terms and conditions of new contracts (or negotiated changes to existing contracts). Through the use of these tactics, customers can prioritize, understand, and address troubled supplier situations with greater advance awareness, leverage and options. Through the imposition and application of statutory and common law contract rights, manufacturers can avoid troubled companies’ use of their own ordinarily broad bankruptcy rights to reject contracts for continued supply of goods. Where signs of financial distress are apparent, or a manufacturer otherwise has reasonable grounds to believe that a supplier’s future performance under a contract for the sale of goods is in doubt, a manufacturer may be able to demand adequate assurance of future performance from the supplier under section 2-609 of the UCC. If such assurance is not provided, a manufacturer may be able to consider the contract repudiated, enabling the manufacturer to resource or suspend shipment, or negotiate or impose more protective or otherwise better terms in order to “shore up” contract rights before a bankruptcy filing. These strategies can drastically alter the parties’ rights after a bankruptcy filing and provide greater leverage in negotiations and better outcomes. To preserve supply, manufacturers also may participate in a pre-bankruptcy workout, intended to keep a troubled supplier on the verge of bankruptcy from ceasing production of necessary parts, by restructuring the supplier’s debt and capital structure. These transactions often include tripartite agreements among the troubled supplier, its significant customers, and its secured lenders to solidify the commitments of each party to keep the supplier operating while the workout (or bankruptcy) is progressing. These agreements commonly consist of access and accommodation agreements, and subordinated participation agreements. Through an accommodation agreement, the customers may provide (often as a group) accommodations that solidify the lenders’ collateral base through protections on inventory and receivables, commitments to continue sourcing of existing parts to the troubled supplier and limitations on setoffs, while the lender agrees to provide working capital financing and not to foreclose. Furthermore, customer accommodations may include financing support, in which case the customer should obtain a participation agreement to obtain collateral for any financing it provides. An access agreement permits the customer, under certain circumstances threatening production and only as a last resort, to access the supplier’s plant to produce parts using the supplier’s own equipment, and employees, pending transfer of the contract or facility to a healthier supplier.